So, these pears - a little on the unripe side by the way - were made into muffins, along loads of almonds and some white chocolate. Delicious combination, and I urge you to try it! The freeze very well, and they can even be eaten directly from frozen - my husband does. Beat butter and sugar until fluffy. Grind the almonds in an almond grinder if you have it, or process very finely in a food processor. Stir into the butter mixture, along with the white chocolate. Add the eggs, one at a time, and stir to combine well. Add the flour and baking powder, and finally the pears. 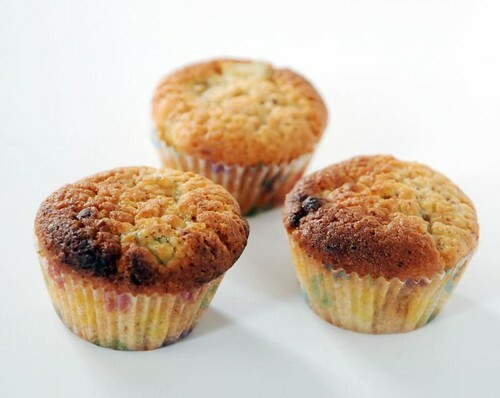 Dollop into muffin cases, and bake at 200°C for 10 (small) - 15 minutes (regular-sized). Kanelbullar kan också ätas direkt från frysen - mycket mycket djupfrusna - allt enl. sambo ;). I think you're in the wrong part of the world to get decent pears, is all. Muffins look quite tasty, though! David, really? Apples and pears are two of few fruits grown locally, so I'd think they'd be ok... If not Swedish, at least usually European. Offthecuff - nice, I'll check it out! Hej Anne. This summer thanks to a local chef I finally learned how to find the perfect pear. Lightly push down along the stem; if the flesh has a soft give to it, the pear is ripe and ready to eat. If the flesh around the stem is hard (or too soft) the pear is not good for eating. I've been delighted at how this works, and have indulged in more tasty pears this autumn than ever before. Patrice is right! We use a simple tool when ripening pears: Check the Neck! If your pear is still hard around the stem, simply leave it on the counter or in a brown paper bag for a few days, and it will ripen to sweet and juicy perfection! You can find more tips and tricks on our website at www.usapears.org. The secret to enjoying pears is poaching them. Peel, slice or chop the pears. Cover with water (or wine), lemon juice, vanilla, sugar. Simmer until soft. If you like, you can continue cooking to evaporate the liquid and slightly carmelize the pears. Once poached, they chill or freeze well, and can be used in baked cakes, on yogurt, with custard, etc. This method also works well in a crock pot...plus the cooking makes the house smell great!